For drama and excitement it would be hard to beat the finish of the AIL game between Old Belvedere and Naas at Anglesea Road last Saturday afternoon. After leading for most of the second half Naas found themselves behind as the clock ticked to 80 minutes. In a last desperate attempt to rescue victory the visitors threw everything into attack, but when Fionn Higgins was bundled into touch that appeared to be game, set and match for Belvedere. Referee Helen O’Reilly was just about to blow the final whistle when the linesman intervened. What followed was a long discussion between the two of them before O’Reilly awarded Naas a penalty. However it was over 45 yards from the posts, and out near the sideline so the chances of a score appeared slim. But up stepped Peter Osborne and with a superb kick the ball scraped over the bar to give Naas a dramatic victory. Naas went into this game on the back of a losing run of four, but with many first choice players returning from injury optimism was high that victory could be secured here. It was one of those players who set up the first scoring opportunity for the visitors after 12 minutes. Fionn Higgins picked up a ball deep inside his own 22, he cleverly evaded two tackles and linked up with Peter Hastie. The latter left another defender in his wake before kicking deep into the Belvedere half. The home side were penalised for holding on in the subsequent ruck and Peter Osborne make no mistake with the resulting penalty. Belvedere struck back within six minutes. Out-half Sean Cribben made a decent break for them and when he was tackled just outside the 22, some quick handling by their backs put Peter Maher in at the corner to score, but Steve Crosbie missed the conversion. There was only to be one more score in the opening half, and it went to Naas following a great scrum where they drove Belvedere right back to win a penalty. Osborne again was successful although he did miss another chance on the stroke of half-time to increase the Naas lead. As it was the visitors heard the half-time whistle leading by 6-5. Some great work by the pack led to Naas scoring their first try after 45 minutes. After winning a scrum a series of pick and goes drove the home side right back, before the ball was quickly transferred out to the backs. When Andy Ellis received it near the corner he still had a lot of work to do, but he showed great strength to squeeze in for a great score. The conversion was missed but Naas now led 11-5, and this lead was stretched to nine points on 52 minutes when Osborne kicked another penalty which was awarded for a Belvedere player not rolling away at a ruck. But the home side responded in a positive way and were to enjoy their most fruitful period of the match for the next ten minutes. 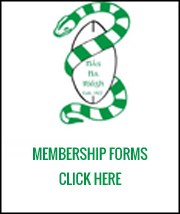 They had a try correctly disallowed on 58 minutes for crossing, but Naas did not heed the warning signs and within sixty seconds Belvedere scored a great try, when some slick handling by their backs put in Jack Keating for a score in the corner. Steve Crosbie made light of a very difficult conversion attempt by slotting the kick, and almost immediately he was again on target with a penalty after Naas were penalised for hands in a ruck, to give Belvedere a 15-14 lead. It was all Belvedere at this stage, but some brave defending by Paul Monahan, Ryan Casey and Adam Coyle to name three held them at bay, before Fionn Higgins managed to intercept and take play up to the 22. From the subsequent ruck the home side backs strayed offside and Osborne restored the Naas lead with a confidently struck kick. But Belvedere were back in front on 78 minutes. O’Reilly awarded a penalty against Naas for wheeling at a scrum and Crosbie kicked the penalty for what appeared to be the match winning score, before the last gasp Osborne effort that denied them victory. This victory leaves Naas in third place in what is an incredibly tight table. Just how close it is at the top is illustrated by the fact that St. Marys College led the league last Saturday morning. However a defeat to Old Wesley that afternoon saw them drop to seventh. Next up for Naas is a home fixture against Armagh next Saturday afternoon. Kick-off is at 2.30 and all support will be greatly appreciated. Old Belvedere: Danny Riordan, Jack Keating, Tom Molony, Steve Crosbie, Peter Maher, Sean Cribben, Paraic Cagney, James Bollard, Eddie Rossiter, Roman Solanoa, Jack Kelly, Conor Owende, Karl Miller, Eoin O’Neill, Eoin Sweeney. Replacements: John McKee, Adam Howard, Gerard Hill, Ben Carty, Fergus Flood. 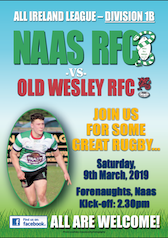 Naas: Peter Osborne, Fionn Higgins, Andrew Ellis, Johne Murphy, Fionn Carr, Peter Hastie, Richard Fahy, Jordan Duggan, Graham Reynolds, Adam Coyle, Paul Monahan, David Benn, Ryan Casey, Will O’Brien, Paulie Tolofua. 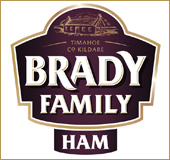 Replacements:Cathal Duff, Conor Doyle, Ruadhan McDonnell, Pierce Dargan, Niall Delahunt.